I had trouble with my passage back home to Davao. It was the Sinulog Festival and Trans-Asia Shipping Lines’ problems that caused it. At first I was planning a way back home through Zamboanga which I normally do. I take the Zamboanga Ferry of George & Peter Lines to Zamboanga. With that I am able to cover the ports of Dumaguete, Dapitan and Zamboanga. Additionally, I am able to cover the various local ports of Zamboanga City plus its two shipyards. I then go home with thousands more of additional photos. But I was in for a shock when I went to the G&P ticketing office. I never thought that their ferry to Zamboanga will ever be full. Usually, it is only ¼ full or even less that there are no more assignments of bunks and one can choose whatever pleases him. They would even upgrade some of the Economy tickets to Tourist. I did not know that a significant number of people from Zamboanga del Norte go to the Sinulog Festival. And to think there are a lot of ferries going to Dapitan aside from the Ceres buses. Well, the Monday schedule of Zamboanga Ferry is what made her full. It was the first day after the Sinulog Festival week. My next plan was to take the Tagbilaran-Cagayan de Oro ship of Trans-Asia Shipping Lines, the Asia Philippines. I made an early inquiry days before with their main office. They said the schedule is MWF. And so I thought I can take their ship days after Sinulog. I did not think Sinulog will impact the Tagbilaran-Cagayan route. I will have the chance to shipspot Tubigon and Tagbilaran ports plus take Bohol bus photos and maybe have some sightseeing too in Tagbilaran. When I tried to purchase a ticket for Asia Philippines, Trans-Asia said the ship only only Monday voyages. How come shipping company employees themselves doesn’t know how to give accurate information? And at the head office at that? 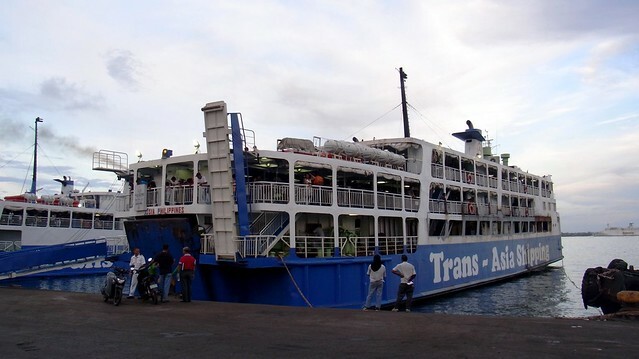 It seems with their lack of ferries, the unreliability of some of their ferries and the wish to also play the Iligan route even though they lack ferries plays havoc on the schedules of Trans-Asia Shipping Lines that even their ticketing employees are in the dark. I then asked for their nearest available Cebu-Cagayan de Oro trip (as Cokaliong does not serve that route). A Thursday ticket was available for Trans-Asia 9 and I purchased one. But the day before the trip, there was a text message to me from the company saying our trip was cancelled for “technical reasons”. And so it seems the old engine bugaboo of the Trans-Asia 9 wouldn’t go away really. 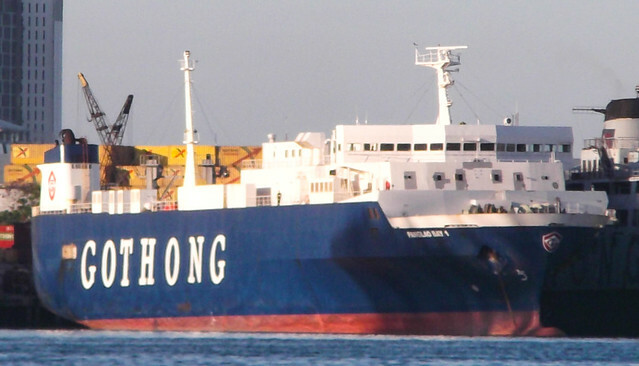 Maybe she is better off now as a Cargo RORO ship like the Trans-Asia 5 when the new Trans-Asia 1 becomes available. I immediately went to the ticketing office of Cokaliong Shipping Lines even without a refund yet for I want to be ahead of the others. With no ship running to Cagayan de Oro I thought there might be a crush soon in the Cokaliong office. The other Cagayan ship, the Lite Ferry 8 of Lite Shipping didn’t appeal to me much. Had a hard time deciding at the Cokaliong Tower ticketing office. I didn’t really want a Nasipit ticket as that port is not really appealing to me from the ship spotting point of view and also from the bus spotting point of view (all yellow buses from there). They have no Cagayan de Oro trips (yet). And their Ozamis-Iligan ship was the same ferry I rode from Masbate to Cebu, the Filipinas Ozamis. It was what was indicated in their schedule board. I didn’t like their Surigao ships too and I have just been there. As much as possible I don’t want to ride a ship I have already ridden before or go via port I have just been to. I asked the ticket seller. No, it was the Filipinas Nasipit that will be doing the Ozamis/Iligan route on a particular day (as they do the Ozamis/Iligan route four times a week now). That clinched it. A new ship and one I have not been aboard before. That will also give me the chance to visit Ozamis again after a long time and also Iligan too with the possibility of a Mukas shipspot too. I have not been to Mukas port for a long time too. There was something new in the Cokaliong House. They now have an interactive computer by the door manned by cadets that will show what accommodations are still available. That sure takes a lot of load from the ticket sellers and crowding at their stations. Our trip was at 8pm and I tried to be early but was not able too. Minsan mas mahirap pa talaga ang may hatid. It was nearing dusk when I arrived in Pier 1. By then I had already missed a lot in shipspotting inside Pier 1 and also inside the Cokaliong wharf. Darkness was getting hold already when our shuttle bus parked near the stern of the Filipinas Nasipit. Sayang. I know my shots are already blurry and no use using zoom for the ships passing by. The Tourist of Filipinas Nasipit was nice. It looks like the Tourist de Luxe of Sulpicio Lines and the Tourist of Trans-Asia 5 but it does not have the individual charging sockets of the latter. While not yet sailing I stayed in the open-air section where there were tables and seats. It was a good viewpoint when the ship will be leaving Cebu port. I noticed the Filipinas Nasipit has a lot of cabins. I wonder if they ever get full anyway. The Economy was the same Economy of Cokaliong which are clean and functional. There was also a lounge at the side of the Tourist which is nice plus one near the canteen. Actually those can double as additional accommodation if the ship is completely full (but the Coast Guard won’t allow that even though life jackets have an allowance of 10%). I did not roam very long for the next day I will have the chance between Ozamis and Iligan. There will be better light by then with less passengers. I retired early as there will be an early arrival in Ozamis but I found out the aircon was too cold when it was midnight already. We were only eight in the semi-private cubicle and we had a packaged-type airconditioner plus doors that seal us from the lounge and the passageway on the other side. We were in final docking maneuver in Ozamis port by 4:30 am and suddenly I had a problem since I forgot my cheap but trusty umbrella in Cebu which I used in all my days of shipspotting there. It was nearly a whiteout but soon the rain abated a little and passengers can disembark. I disembarked too but where to was settled by the rain. No joy touring a city in continuous rain but in a ferry it wouldn’t be much of a problem as long as I can board it. I asked and I was given a bad reply regarding the ticketing office to Mukas. It was outside the gate (so a passenger from Manila or Cebu with baggage will then have to get out first? that is what one gets from ISPS ports). So I then just headed straight to the ferry past the guards (a purposeful walk will sometimes do the trick). I asked the Chief Mate for direct passage and I will just pay him. Turns out it can be done contrary to what the guards said. I had a ticket but I was unmanifested and I did not pay the terminal fee. Government functionaries sometimes makes rules na abala lang sa pasahero especially in the rain. There are other ways of making a manifest. It can be done aboard the ship. And so that there will be no more counting then let Coast Guard list the names of the embarking passengers. They are not sailing anyway and they can even do their patrol by boarding the ferry as they don’t have patrol ships anyway. It was still dark when I boarded the Swallow-I of Daima Shipping, the sole shipping company sailing the Panguil Bay crossing. She is a double-ended ferry and a decent one but the problem was the rain got stronger and there were puddles of water in the passageways. When we sailed it was daybreak already and I noticed the St. Francis Xavier of 2GO has just anchored offshore. I thought she was waiting for the Manila Bay 1 of CAGLI to depart. Manila Bay 1 has started raising steam already by then. The other ship, the Fortune freighter was still docked in port. In the distance the outline of Trans-Asia 2 of TASLI was already visible (and so we were faster than her). Crossing Panguil Bay, aside from the fishing bancas, I noticed that there were four double-ended ferries of Daima which were sailing and there were four more moored in Mukas port. We then docked in Mukas port and I was able to take close shots of the four and I disembarked. I saw a long line. Again I paid direct to the Chief Mate because I said I cannot tackle a queue that long where I can miss the ship which is obviously leaving after discharging and loading and I am a passenger of Filipinas Nasipit. Again I was unmanifested and I did not the terminal fee (but then I did not use the terminal). Sometimes ang habol lang naman talaga ng mga paghihigpit ay magawa ang manifest para masiyahan ang Coast Guard at mabayaran ang terminal fee. The Swallow-II was docking into the port the moment we pulled. Nice to see her and I have a special respect for her. She was the former Our Lady of Mediatrix which was burned by the white phosporus explosion that hit two Super Five buses aboard her in 2000. She survived and it is a credit to Daima that they have the patience to bring her back. Good to see her again 16 years after her mishap. I did not see her personally again after the burned-out wreck I saw the day after the explosion. I thought the St. Francis Xavier will change places with Manila Bay 1 but when we returned she was still anchored. Nearing Ozamis, I was surprised by all the kwitis being fired and by the crowd waiting inside the port. There were priests and altar boys plus the religious type of crowd howling “Viva Pit Senor!”. It turned out the Trans-Asia 2 was carrying their image that went to Sinulog. So I thought that was the reason why the St. Francis Xavier was not docking. Ferry when we are in Dumaguete and Dapitan. We pulled anchor even before 7:30am and soon was on our way to Iligan. I noticed even at a distance that the St. Francis Xavier was still anchored when to think that even when Manila Bay 1 was still docked there was still one dock free. I dunno but I can only hazard the guess Ozamis port is penalizing St. Francis Xavier for delayed arrival. It was good I did not bet on her. She was supposed to arrive 8pm the previous night but she arrived 10 hours late. I did not take her altho I have not yet ridden her because her arrivals and departures in Ozamis and Iligan are both at night. No good shipspotting with that and even my bus spotting will be ruined. I made rounds of the ship after we left Ozamis. It was easier now for there was light already. I noticed we were less than 1/5th of the passengers that left Cebu. So it seems most Iliganons and Marawinons take the Cagayan de Oro ferry. It was easy roaming except that they do not want us passengers in that free area behind the bridge. And they do not shoo kindly too. Did the Cokaliong crew attend the shooing seminar of 2GO? But they were a poor copy as the 2GO crew have more politeness left. I don’t like it when a shipping company treats its passengers with distrust. We passengers do not shower them with such distrust. They should be fair. We docked in Iligan port at 9:30am. I was happy for the earlier arrival because I was hoping to make Maramag, Bukidnon before dark (I don’t care after that since all the buses will then be red; I just wonder if the Philippine Competition Commission realizes that Mindanao, at least in the bus sector is governed by a monopoly). There were no other ferries in Iligan. There were two cargo ships, one a foreign bulker, the Spring Canary, the other a Roble freighter, the Star Ormoc. There were tugs and harbor pilot boats. But then except for us there was almost no other activity in the port. Would have been merrier if the St. Francis Xavier was a little ahead of us. But it was good as I saw the former National Steel port and the Shell tanker jetty but the distance was great. Kiwalan is too distant, too. I no longer tried to make a round of Iligan. Davao is still too far away and I might get too tired. I just took the jeep which I know will still make a round of the city and it did. In the eastern bus terminal, I was able to take a lot of bus photos. My first choice was an ordinary Rural minibus because it has a front seat free. I changed to an aircon bus which also had a front seat free but not the one by the windshield. The aircon fare was P115 and the ordinary fare was P120. My seatmate told me before Christmas the aircon fare was just P95 for the 87km distance. Simple predatory pricing by Rural Transit to increase the pressure against Super Five bus. If we had only antitrust laws like in the US then Rural Transit would have to pay a hefty fine and/or the owners would have to spend some time in jail. Transferred to a Pabama aircon bus in Cagayan (which has no gold anyway) because in the afternoon it is hard to look for an aircon commuter van. They have an all-new fleet now and of course they are cheaper. If I have a choice I will choose a Rural Transit competitor that has a front seat free (the front seat is the primordial consideration to me). My ticket was for Maramag only and not Kibawe, the destination of the bus. It was a rainy drive from Cagayan nada Oro to Maramag and I spoiled a lot of shots. It was getting dark already even before we wheeled into Maramag. I then changed into a lousy red bus which has no competition and our drive was very slow. Imagine a 5-hour drive at night for less than 160 kilometers. And again I had an incident in the Task Force Davao permanent checkpoint (the Supreme Court has already declared that permanent checkpoints are illegal; so much for the ballyhooed “rule of law”) and I held up the bus for more than 20 minutes with the passengers in the rain below. It’s no longer martial law, I know my rights and so and they can’t just tell me any “balaod-balaod” thing (“balaod” is law in English). It the end I was able to force the Task Force Davao sergeant to admit they have no right to force down the passengers like cattle (and with threat at that) or inspect the baggage without search warrant (yes, that is what the law says but people don’t know that because we have a very poor legal education system). When they boarded back the passengers were furious at them and not at me. Now if only our lawyers and judges have more guts. Anyway, I survived that long land trip of nearly 400 kilometers, my longest land leg in my December-January travel. The next day Aris was surprised I insisted on our previously agreed upon meet and tour to Samal. Seems I am back in form.